Its concept is to combine chemical and enzymatic catalysis with insects-based biological conversion via termites, within a biorefinery integrated approach. The project is conceived to avoid waste production by recycling waste bio-based products and improve the sustainability of existing second generation biorefineries. It addresses three types of recalcitrant raw materials: lignocellulosic residues from ethanol production, lignins dissolved during pulping process and lignin-like humins formed by sugars conversion. Enzymatic and process engineering will be implemented to design efficient conversion routes and permit technological breakthroughs. A transversal platform for the characterisation of biomolecules will be settled to identify bio-products of commercial interest among lignins and humins multifunctional nanoparticles, phenolic antioxidants, insects-based chitosans and aromatic chemical intermediates. Thanks to this platform, Zelcor will enhance knowledge of the structure-function relationships and the mechanisms involved in recalcitrant raw materials catalytic depolymerisation and bioconversion. Demonstration of the approach feasibility will be performed by process scaling-up, formulation of end-product prototypes and value chain sustainability and safety assessment. The presence of industrial partners all along the value chains, from lignocellulosic feedstock to end products, will facilitate demonstration activities and technological transfers. With this strong industry drive, Zelcor will lead to large scale production of biomolecules for cosmetics, packaging and chemical industry, as well as novel biocatalysts. Zelcor is a 6.7M€ collaborative project, 49% of which for SMEs (43% EC grant). It gathers 18 organisations from 8 countries, including 6 academia, 8 SMEs, and 3 corporations. The nova-Institut partners in this project in the sustainability assessment with a Life-Cycle-Costing (LCC) approach and a techno-economic evaluation (TEE) as well as an analysis of potential social and socio-economic impacts. Additional nova is responsible for the dissemination activities together with the consortium leaders from INRA. 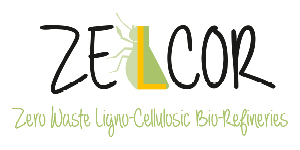 ZELCOR receives funding from the European Community’s Horizon 2020 (H2020) and the BBI-JTI under the grant agreement No. 720303.